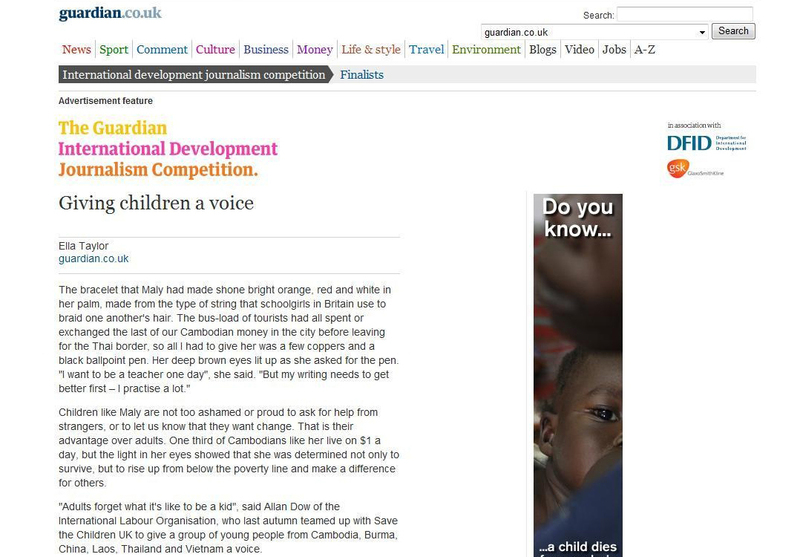 My article on giving children a voice was published on Guardian.co.uk. The article was inspired by my travels around Cambodia, and discussed the work of organisations who recognise the important influence that children can have in shaping the world. Written for the Guardian’s International Development Journalism Competition, the article presented a unique angle on one of the UN development goals, with interviews from experts. Pitted against over 400 other entries, it won me a place in the semi-final of the competition in 2008. The competition, run by The Guardian, The Department for International Development and various charities, called for writers to investigate one specific area of international development, based on the UN Millennium Development Goals.